Sadly, I can’t attend the meeting in College Park, Maryland today regarding public comments in preparation for the International Cooperation on Cosmetics Regulation conference in November, but I’m emailing my input. My first issue: the United States treats new sunscreen UV filtering agents as though they are new drugs, where the industry leaders (meaning: EU, Japan, Australia, and Korea) in sunscreen research and development treat them as cosmetics. Therefore, there is a huge burden in bringing new UV filtering agents to market. Thus, the United States lags almost two decades behind these other countries in sunscreen agents. In the last ~18 years, we’ve had one UV filtering agent approved for one single SPF 15 (!) sunscreen. While I can certainly see reason for caution, we’re far more permissive in other things that go directly on a consumer’s skin which may not provide the results alluded to by the marketing hype. If a UV agent’s already approved in the EU and Japan, how about we allow it to be used in the US? I know the cosmetic industry will never agree to this, but I have to bring it up: it’s easy to label cosmetics for things like hydrolyzed wheat protein and hydrolyzed wheat gluten—because they’re used in almost zero cosmetics. Though, as a celiac, I do appreciate the labeling even though it’s not the limiting factor for me. What would be hard to do is to label cosmetics for tree nuts, because that would include coconut. Coconut derivatives are in almost all facets of cosmetic formulations: from the stearic acid that thickens mascara, the sodium laurel and laureth sulfate that comprises one of the first two ingredients of almost all commercial shampoos, and the surfactants, emollients, and emulsifiers that make commercial products look and feel like they do (and stay in solution through several coconut-derived versions of PEG, as well as many that are not coconut-derived). However, it really would be nice to actually not have to look up ingredients to see if they’re likely to be coconut derived. Then I won’t have to wonder why I suddenly reacted to this one product, as I might actually know if they changed from a palm source to a coconut one. A surprisingly large number of people react to coconut-derived sulfates and coconut-derived fatty acids, among other things, and that’s not even getting into the palm sources of, say, glycerin. But please, given how prevalent coconut is, could we possibly consider it an allergen some day? I was married to a soap chemist and had 34 new-to-me brands of shampoo to try (driven in from Canada) to determine what my allergy was. Most people just have the mystery acne, and are given dermatology formulas that, no joke, contain more of the exact same allergens. Thank you for listening. I’m really looking forward to hearing more of the conference’s progress. Two years ago, I ran out of sunscreen before arriving in the Maldives. I went to the gift shop, where the only thing they had was something they described as a “total block.” Which, short of a space suit, seemed rather optimistic and improbable. I didn’t know how to evaluate the ingredients on the label, but I did notice that the two physical sunscreen blocking agents I knew about—zinc dioxide and titanium oxide—were nowhere to be found. Fortunately, the hotel had another gift shop. I strolled over there, only to find that they had a very reasonable SPF 50 sunscreen. What I didn’t know at that time was how incomplete my understanding of sunscreen was, nor why my lack of knowledge was so important. 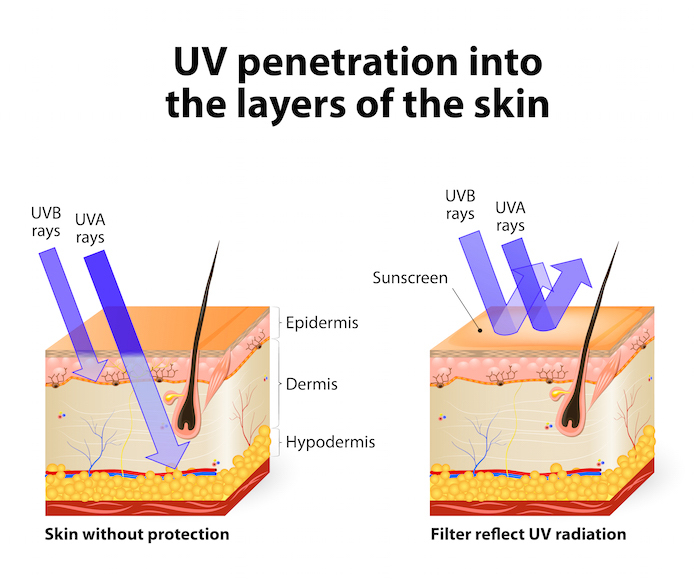 UVA and UVB penetration. Illustration © edesignua and used under license. UVB (think “burning”) penetrates the epidermis with rays between 290 and 320 nm. UVA (think “aging”) was initially thought not to cause skin cancer. Unfortunately, it’s highly associated with cancer. It penetrates down to the bottom of the dermis. Tanning also happens with UVA, so for a long time it was thought that if you blocked UVB, you’d encourage a nice healthy tan while preventing burning and skin cancer. UVA is broken into two wavelength bands: UVA1 (340-400 nm) and UVA2 (320-340 nm). SPF ratings are only for UVB. There is no rating system, nor any requirement to even mention UVA in American cosmetics. Sure, a product can use the “broad spectrum” phrasing, but there’s still no requirement that it be world-class UVA protection. In the US, sunscreen is considered a drug, thus new blocking agents have to be approved by the FDA. That means a company needs to sponsor the research (which costs millions) and lead the blocking agent through the whole approval process. Which is fine if you’re a company that is patenting a drug where the exclusivity will, one hopes, pay for the approval process. In the case of sunscreen blocking agents, however, they aren’t patentable (they’ve been in use too long), so one company would be spending a ton of money to allow other companies to profit equally, but without having spent the cost for approval. Hence, there is zero corporate incentive to get new blocking agents through the approval process, and we all suffer as a result. Yay, capitalism. Worse, there had been at least eight new (to the US) sunscreen ingredients waiting for approval for more than five years. The ironically named Sunscreen Innovation Act, passed in 2014, was supposed to help us catch up with the rest of the world. Thus, Americans respond to signs of aging after the fact rather than with prevention. This is a big part of the reason the US share of the global botox market is predicted to reach $2 billion annually by 2018. While botox is used in non-cosmetic procedures such as stroke rehab and migraine prevention, much of the US market is about wanting to reverse aging signs in skin—aging that could have been prevented, in part, by better sunscreens. I’m only going to show US ? ?, Australia ? ?, EU ? ?, Japan ? ?, and Korea ?? since that will cover most of my readers as well as the products I’m talking about. Heavily borrowed from the Wikipedia Sunscreen page and this skincancer.org page; where they disagree, I’ve used the Skin Cancer site’s answer. Note: I’ll use the French flag ?? instead of EU flag ?? as there is no emoji support in Mac/iOS yet for this emoji. Korea ?? information is currently incomplete as I’m only listing agents I’ve looked up that are included in Korean sunscreens or which were on a 2008 chart. Also, as there are almost a dozen sunscreen agents on that chart approved only in Japan, I’ve omitted those. Even excluding Japan-only sunscreen agents, there are about as many approved only outside the US as approved for the US. The first video is from British beauty blogger Lisa Eldridge. I mention this because some of what she says is from a very EU-centric viewpoint, specifically when she’s talking about approved sunscreen agents. YouTuber Lisa Eldridge has a rundown on sunscreens, focusing on European brands. YouTuber faceturtle has a review of 9 Asian sunscreens. L’Oréal is the top nanotechnology patent holder in the United States. Rick brought the Jessica Alba Honest Company Sunscreen backlash to my attention. After looking at the ingredients, I agree with much of this Forbes piece. The real problem is one of user psychology: people don’t want to be white all over from their sunscreen. By using only a single physical filter (zinc oxide, famous for lifeguards’ white noses), they aren’t offering protection to people who spread it too thinly. So, an admirable goal that has issues in the real world. Also, apparently there was a reformulation, then the reformulation led to unexpected drops in effective SPF due to the product settling out of emulsion (it sounds like from my reading of the article, anyway). How many people obey labels to shake the bottle? My current sunscreen, The Face Shop Natural Eco Sun Sebum Control Moisture Sun SPF 40 PA+++ uses only chemical sunscreen agents, four of which are UVB (it does have good UVA coverage through the fifth agent). Huh. The Face Shop Natural Sun Eco Sebum Control Moisture Sun SPF40 PA+++ is a Korean Sunscreen also available in US Face Shop stores. It only uses chemical filters. La Roche-Posay Anthelios XL has some of the L’Oreal patent goodness (and nanotechnology research goodness) in it. Not for sale in the US, but you can import it from overseas; it’s cheaper to import from Europe, IME. Bioré UV Aqua Rich Watery Essence SPF 50+ PA++++ is also really awesome. What sunscreen do you like? Fascinating article! As someone from Celtic Ginger ancestry I know all too well fighting to keep from burning. I know reptiles need UVA and UVB spectrum to absorb calcium and thrive, or at least my bearded dragons do. I believe turtles and tortoises require different levels, and UVA/UVB light play a role in bird’s plumage as well as far as what their mates see. It sure is complex science.